Mishti Chakravarty who was recently seen in the film Manikarnika was roped in by India Forums and here we did a fun makeup Rapid Fire with her. We hope that you guys enjoyed this video, if you did do Comment and tell us. 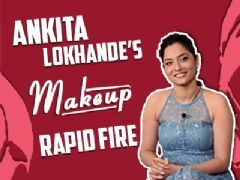 User Comments on video titled "Manikarnika Fame Mishti Chakravarty Takes Up The Makeup Rapid Fire | Exclusive"